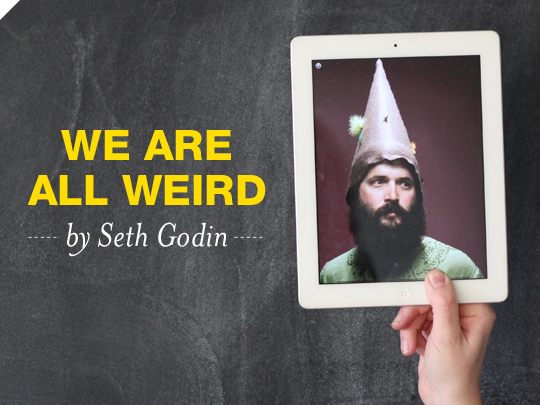 The latest book of Set Godin, one of the most popular marketing directors in America, “We Are All Weird”, again attracts with precisely made observations and brilliant reasoning , both spoken in his own specific way. Godin is a bestselling author whose books have affected the way people think about marketing or work. If you have already read something written by him, then there is no chance to mistaken his style. . In “We Are All Weird” he states that life is too short to be reconciled to do what is considered to be rightly. The title reflects some of the key ideas in the books and emphasizes on the people’s weirdness nowadays. “We, as in this is about us, not you, not him, but all of us, and WEIRD, as in we need a word for the opposite of normal, and by accepting a word that normal camp would like to use to shun us, I’m embracing the very notion that the book is about”, writes Godin for Forbes magazine. In addition, he puts a great emphasis on the huge mistake of Capitalism to confer prizes on companies which produce only historical effective products.The book has only 11 000 copies, and this is not fortuitously. When we buy real books, paper books, we are looking for good reasons. Well, Dear Readers, perhaps scarcity can be considered as one of those reasons. Set Godin provokes the open-minded thinking and encourages a longing for change in the readers. His book influences anyone who wants to be authentic, to dance to the beat of their own music, or make a difference in the world. Are you a inner critic, or the one being told that you are not enough, or your work is not good enough, then buy this book. Let your freak flag fly high.